Magnesium Supplements: When, Why and What is the Best Kind? Do you need to take magnesium supplements? If you eat at least 50% of your diet as raw food and have a wide variety of foods, you probably do not need to supplement your magnesium. When there is a specific health problem or if you have a condition that causes excessive loss of magnesium or if it limits your bodies magnesium absorption, you may need magnesium supplements. Below you will find the sources of magnesium. 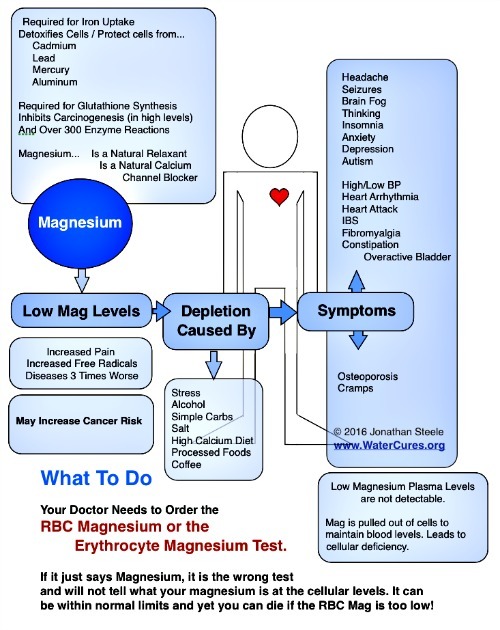 First, some reasons why you might have low magnesium levels. You could be loosing too much magnesium in your pee. There could be a failure to absorb magnesium in your diet. If you have diarrhea and or steatorrhea (too much fat in your poo), and or excessive vomiting, you could be magnesium deficient. Certain drugs also cause you to loose magnesium. If you are on these medications, your doctor will be monitoring your magnesium level and supplementing if necessary. Diabetes that is not controlled well can result in magnesium loss in your urine. Over-indulgence in alcohol can increase your risk of magnesium deficiency. Up to 60 percent of those who abuse alcohol have been found to have low magnesium. Should you go into withdrawal, you may be in the 90 percentile that are low in magnesium. Take-away: If you are using the water cures protocol to stop your addiction to alcohol, then you need to make sure you have adequate magnesium in your diet. We do not recommend magnesium supplements because of the inherent problems with supplements. For most people, the safest way to increase your magnesium is through diet. There are two ways to do this. Liquid chlorophyll and spirulina (a microalgae that has been consumed for centuries due to its high nutritional value). Individuals with these conditions may need extra magnesium. The most common symptom of fat malabsorption, or steatorrhea, is passing greasy, offensive-smelling stools. Those with low blood potassium and calcium may not have enough magnesium. Doctors usually monitor for this. Boron supplements may decrease the amount of magnesium flushed out in the urine. This can cause in increase in blood magnesium levels. Older women are at greater risk if they do not get adequate magnesium in their diets. Younger women who do not exercise may also be affected. The effect on men is unknown. What is the Best Way to Get Extra Magnesium? Magnesium Bicarbonate Recipe (make it for about a dollar a month). This is one of the best ways to get magnesium. Magnesium is needed to help the enzyme gamma glutamyl transpeptidase work in the making of Glutathione. While it is recommended that we get 400 mg, optimum daily need may be as high as 490- 700 mg.
For most people, eating at least five servings of fruits and vegetables every day will help maintain magnesium levels. Magnesium is best provided from raw foods. If you have never tried raw food that has been prepared into a meal, then you are in for a treat. Get any raw food recipe book and give it a try. You are in for an incredible treat. You can get the highest sources in your diet from halibut, uncooked spinach, squash, raw pumpkin seeds, sunflower seeds, toasted sesame seeds, beans, walnuts, almonds, peanuts and Brazil nuts. Dark-green leafy vegetables are the best source of magnesium. When more is needed or if someone wants to optimize their magnesium, then a table spoon of liquid chlorophyl or a table spoon of spirulina in a glass of water every evening before bed. Some will add up to 1/4 tsp of unprocessed salt. If no cancer is present and if not dealing with candida, then a teaspoon of sugar or a spoon of raw honey added to a glass of water will do wonders. For some, this brought dramatic health improvements alone.